Today marks President Trump’s 100th day in office. Turn on the TV this evening, and you’ll hear a lot of debate about what the President has – and hasn’t – accomplished since January. But there’s one area in which he has far exceeded expectations: Americans are energized and engaged at a level never seen before. From marching for science to standing with immigrants, President Trump has galvanized a grassroots movement we’re proud to be part of. At Public Justice, we spend every day fighting for equality, access to the courts and a cleaner planet. 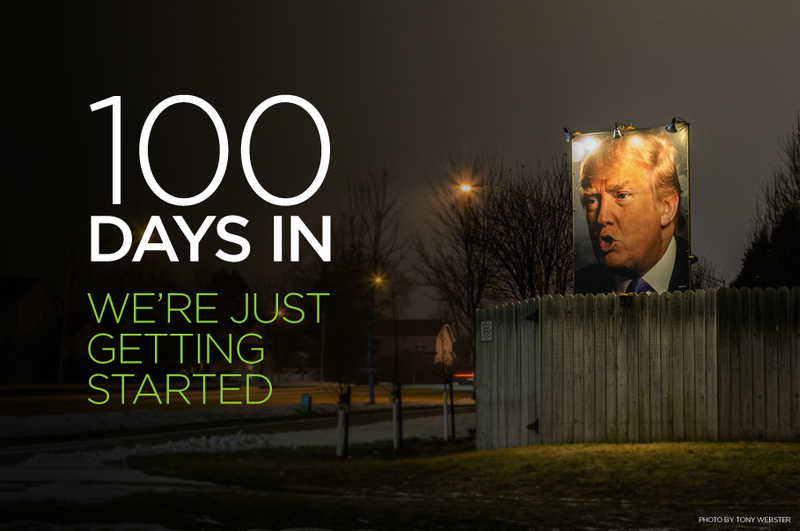 The past 100 days were no exception. We were proud to fight attacks on class actions and bills to impose damage caps on non-economic damages, to mobilize opposition to Scott Pruitt’s nomination to lead the EPA, to take on the President’s Muslim ban in court and to call out the Administration for rescinding guidance meant to protect transgender students. But the President’s not done yet, and neither are we. The next 1361 days will be just as important as the last 100, and maybe more so. That’s why we’re gearing up to be even more visible, active and outspoken over the next four years. And that’s why we need you with us. We’re launching a multi-prong Public Justice media campaign to educate parents about their children’s rights to be protected against on-campus assault and violence under laws like Title IX. We vehemently disagree with the President’s selection of Candice Jackson, who has seemingly based the credibility of sexual assault victims on the political affiliation of their alleged perpetrators, to run the Department of Education’s Office of Civil Rights, the agency charged with protecting students, and we will work around the clock to ensure parents have the information and resources they need to fight back against violence in schools. Already, the Environmental Protection Agency is wiping away critical regulations meant to fight climate change. Public Justice’s Environmental Enforcement Project has just won a major victory against the coal industry, and we’re prepared to step in as the EPA steps back from its responsibilities to keep our air and water clean. Every day, the White House and Congress are working to implement the big banks’ wish lists. Republicans are calling for Richard Cordray, Director of the Consumer Financial Protection Bureau (and consumers’ greatest champion in Washington), to be fired. Lawmakers are pushing bills to wipe away class action lawsuits. And Goldman Sachs is running the Treasury Department. We’ll continue fighting for consumers, defending the CFPB and rallying grassroots support to stop Congressional give-aways to corporate lobbyists. But we can’t do it without you. If you have recently renewed your membership, made a large gift, or otherwise supported us, we are very grateful and thank you. But if you haven’t taken any action recently, I’m asking you consider a tax-deductible gift to Public Justice to ensure we have the resources we need to fight for the next 100 days. And the 100 days after that. Because we’re just getting started.